What is the Supreme Immune Health Formula™? What is the recommended serving? Is the Supreme Immune Helath Formula safe to take with ______________? How long does a 16oz bottle last using the recommended servings for adults? How often do you take this product? Who would benefit from taking the Brazilian Supreme Immune Health Formula? Why is bees’ honey used? Honey contains sugar, so how is it safe to use by someone on a restricted sugar diet? Why is 1% Distillate used? Where did the formula originate? Are there any potentially harmful preservatives? How do I become a reseller and buy this product as a wholesale distributor? Where can the plant aloe arborescens be found and what is its botanical description? What do I do if I receive product damaged in shipment? Why is Citric Acid Added? The formula is a Nutraceutical Dietary Supplement that brings together in a proprietary blend the therapeutic properties of two potent ingredients of all natural Whole Leaf Aloe Arborescens liquid with pulp and raw, unheated and unpasteurized honey that provides powerful support for the immune system and helps maintain optimal health. Both ingredients are also known as super foods from nature. The formula also provides gentle cleansing of toxicity for the whole body. Adults Age 12 and older: One tablespoon three times a day (breakfast, lunch and dinner) 20 minutes before eating a major meal. This allows quick digestion and absorption into the blood stream. If working it is ok to take the serving in the morning early evening and before going to bed so you don’t have carry a bottle to work. Optional: For improved taste and digestion take serving in 4 to 6 oz. of water. Children: 6 to 11 years One tablespoon twice daily 20 minutes before eating a major meal. Ages 3 to 5 one tablespoon daily. Children under 3 years of age consult a health care provider. Recommended Use: Use product for 10 days, discontinue for 10 days and then repeat cycle indefinitely as needed. For special use take daily indefinitely. we are not aware of them. When the immune system is seriously compromised use recommended serving and frequency. At least one year. A dark violate bottle is used to protect contents from light and help preserve efficacy of the formula. Can be stored at room temperature in a dark place like a cabinet. Refrigeration is not essential until bottle is opened. Thereafter, please store in a refrigerator. Anyone concerned about their immune system who is battling health challenges related to toxicity of the body from numerous sources such as poor diet or nutritional deficiencies, substance abuse, prescription drug toxins, invasive treatment toxins, environmental pollutants, germs, and the like. People who want to gently detoxify the entire body for improved health. People interested in health maintenance who want to strengthen, revitalize and maintain a healthy immune system while gently detoxifying the body for optimal health and protection.. In the Brazilian natural health formula the immune-modulating property in Aloe arborescens is carried out by the glucomannans, a class of long-chained sugars derived from the plants, which have demonstrated in clinical and laboratory studies to have a wide variety of protective and immunostimulating effects in the human body. Aloe Arborescens Miller contain the largest concentrations of acetylmannan, the most active form available existing in nature. The acemannan molecule, in particular, produces immunomodulating effects that regulate immune defenses according to the body’s requirements. This mucopolysaccharide deals with the damaging processes of the body by acting as an immune stimulant, principally by stimulating the production of T lymphocytes and macrophages from the thymus and the beta cells of the pancreas. What immune depressive conditions have in common is a high incidence of digestive dysfunctions, generally manifested by poor digestion. A common denominator in all the beneficial actions of acemannan is the ability to coat and permeate all the gastrointestinal surfaces, increasing the fluidity and the permeability of these membranes. In this way, it allows the easy expulsion of toxins and an even faster absorption of nutritive factors. This stops the immune system from intervening in internal digestive support, which could cause its compromise, and saves the immune defenses for where they may be really needed. In this way, Aloe Arborescens supports normal homeostasis. Honey is able to move to all parts of the body. It is the vehicle that carries the aloe, which cleanses and removes impurities it finds along the way. This procedure performs general cleansing of the entire body – especially the blood. Purified blood is directly responsible for the health of the body and consequently for the life of the person. By taking aloe arborescens, you are investing in your health as you work toward improving the quality of your life. Honey is sweet like sugar so how is it safe to use by someone on a restricted sugar diet? Honey and refined sugars greatly differ not only in chemical characteristics but also in physiological effects. The circumstance alone that honey contains invert sugars and saves the debilitated alimentary organs the additional labor of inverting commercial sugars, is an important factor and of considerable advantage. Honey provides a natural sweetener that can be used instead of sugar. Honey is a whole food that comes from plant nectar and does not raise blood sugar as simple sugars do. Honey also contains a variety of minerals and vitamins and has a long history as a health food. Honey has traditionally been used down-regulate the unwanted part of the microbiome. Studies show that honey has a lower glycemic index than table sugar. Honey helps regulate normal cell growth. Distillate on its own may seem the least important ingredient, but the third component of the preparation is not used by chance or whim. The distillate helps promote the dilation of the blood vessels. In older people especially, dilated blood vessels can speed up the cleansing action of the aloe and honey. It was discovered in Brazil. 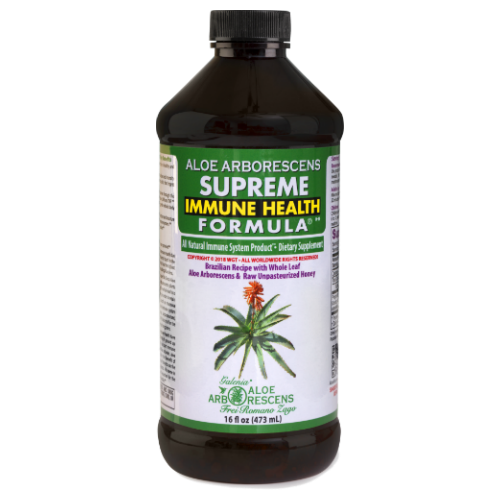 For centuries native Brazilians have used this immune formula consisting of a blend of ground up whole leaf Aloe Arborescens liquid and raw unheated honey to support immune health. Father Romano Zago, OFM (Order of the Friars Minor) Brazilian scholar, aloe researcher and author, publicized this Brazilian immune formula for the benefit of mankind. His name in the trade mark/logo recognizes his collaborative contributions and vouches for the authenticity of the original Brazilian Immune Health Formula in each bottle. No, there are no harmful preservatives. We use all-natural, safe preservatives. There are some Aloe products that state clearly on their label: “No Preservatives.” This is an attempt to gain the favor of consumers who wish to avoid added chemicals in food products. However, since Aloe is a vegetable juice, it must be properly preserved, or it will rot from growth ofnbacteria, mold, or other organisms. The only sure, effective, and approvednway to prevent this is to add small amounts of preservatives such as sodium benzoate and potassium sorbate, which keep bacterial and fungal growth in check, and anti-oxidants such as vitamin C. In addition, an acidic pH discourages microbial replication. Citric acid is usually added to lower the pH of Aloe beverages. The only alternative to these preservatives would be constant refrigeration, which is impractical. The simple fact is that if a product states that it uses no preservatives, it most likely either does not contain any Aloe, or marketing company may not add any preservatives, their supplier or processor added them. There are hundreds of brands of Aloe supplements on the market, but only a handful of processors and growers, who do not wish to risk their reputation or a liability suit by producing a product that will rot. To preserve the nutritional potency of the raw (unheated) Aloe Arborescens juice used in our formula, it must be stabilized. This process involves the addition of small quantities of other ingredients that are part of our preservative system. If someone is marketing an aloe based product that states it is completely preservative-free, you know you’re not getting a completely fresh product. With the new generation of whole leaf aloe-based products, the goal of choosing an effective Aloe Arborescens-based supplement should be to buy the one closest in content to the fresh whole leaf, with the most healing components left in, at the best price. This seems to rule out gel-only products. Health Care Practitioners, Medical Clinics, Health Food Stores, Health Care Product Resellers can use this website to establish a wholesale account and buy wholesale. You must provide a Tax ID number and Business Name, address, etc. The botanical aloe, already classified within the Liliacee family, is currently included in the Aloacee family. The species name arborescens means “tree like” which was originally applied to this species in reference to its stem-forming habit. It is also known as krantz aloe which refers to its natural habitat, a krantz being a rocky ridge or cliff. Aloe arborescens Miller grows wild in tropical and subtropical dry, arid regions of South America, South Africa, the southern border of the Mediterranean Sea, the Soviet Union and the Orient. It is cultivated commercially primarily in Italy. It is one of the few aloes whose range extends from sea level to mountaintops. The leaves are green and slightly concave, the edges are armed with teeth, and the rosettes are situated at the branch ends. Each rosette can produce terminal racemes of cylindrical orange to red flowers. This succulent plant grows up to 9 feet tall. Like its cousin aloe vera, it is rich in nutritional and health promoting herbal therapeutic properties. Save all unbroken bottles for use and send an email to customer service advising them of the number of broken bottles and they will ship new replacement bottles to you at no cost. Citric Acid is an organic acid that is a component of all aerobic living organisms—most abundantly, and not surprisingly, in citrus fruit. This weak acid has been used as an additive in processed foods for more than 100 years as a natural food preservative. By increasing acidity, the low pH conditions produced prevent bacterial and fungal growth, therefore prolonging the life of Aloe-based liquid dietary supplement. It also helps preserve flavor and maintains pH at a suitable level to prevent product degradation. Remember, don’t confuse Sodium Benzoate with Benzene. Benzene is a chemical that has been linked to increased risk of leukemia and other blood cancers. While sodium benzoate doesn’t contain benzene, it can form benzene when combined with ascorbic acid. The Organic Consumers Association says benzene levels between two and 20 parts per billion have been found in some soft drinks containing sodium benzoate and ascorbic acid, also known as vitamin C. The safe level of benzene for drinking water is only five parts per billion, making the amounts of benzene in some soft drinks a health concern. Lissoni P, Rovelli F, Brivio F et al. 2009. Capasso, F., Borrelli, F., Di Carlo, G., Aloe and Its Therapeutic Use, Department of Experimental Pharmacology, University of Naples, Naples, Italy, Phytotherapy Research Vol. 12 Issue S1 pp 124 – 127, John Wiley and Sons Ltd. 1998. Reynolds, Tom, Aloes: The Genus Aloe (Medicinal and Aromatic Plants – Industrial Profiles), CRC; 1st Edition (January 23, 2004). Peuser, Michael, The Capillaries Determine Our Destination, Aloe, Empress of Medicinal Plants, pp. 66, St Hebertus, Sao Paulo/ S.P., 2003. Internal Uses of Aloe Vera by Ivan E, Danhof, M.D., PhD. Private Research Test on file of constituents of Aloe Arborescens Whole leaf juice conducted by U. S. Aloe Research Laboratory.